As Graham was demonstrating some of the techniques, I realised that I had seen most of them before. My Mum taught me to ring a couple of years back, and I have been watching her recently teaching new learners using methods she learned from attending ITTS Module One. This time, I had the opportunity to stand and watch the ITTS tutor and take some photographs too as he taught the second group attending Module One of the course for the Suffolk Guild of Ringers. 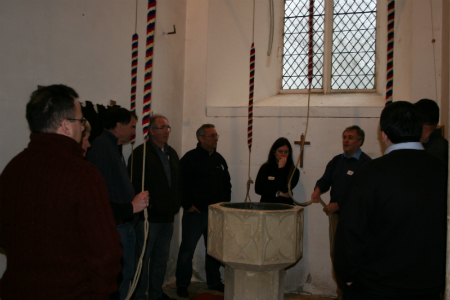 Graham Nabb from the Association of Ringing Teachers came to lead the course which was held at my local tower – Reydon, on Saturday 24th November which was a dreary old day. Although Reydon is about as far north and east in the Suffolk Guild as can be, it was great to see people who had travelled from all over Suffolk in the church, watching intently and then trying out the new skills on each other. They were having fun. But ringing is fun (well, it is for me anyway). The new teachers and mentors now have the challenge of finding and teaching new people to ring now that they have attended the course. This is the bit that I am looking forward to because when you visit other towers you meet the learners, or sometimes they come to your tower. It’s always interesting to see how they are progressing. Also a new ringer = a new friend, no matter their age or experience. For the Suffolk Guild, Module Two is next at The Norman Tower in Bury St Edmunds on Saturday 9th February next year. Wonder what tips my Mum will come home with this time?